This is one that remains in the family, my dad was such a big fan of this pickle and as you can imagine I have certainly inherited that from papa. Just writing this I can see papa eating these lemon pickle and I can hear the way he used to eat – lip smacking “chatpat” chaaat. 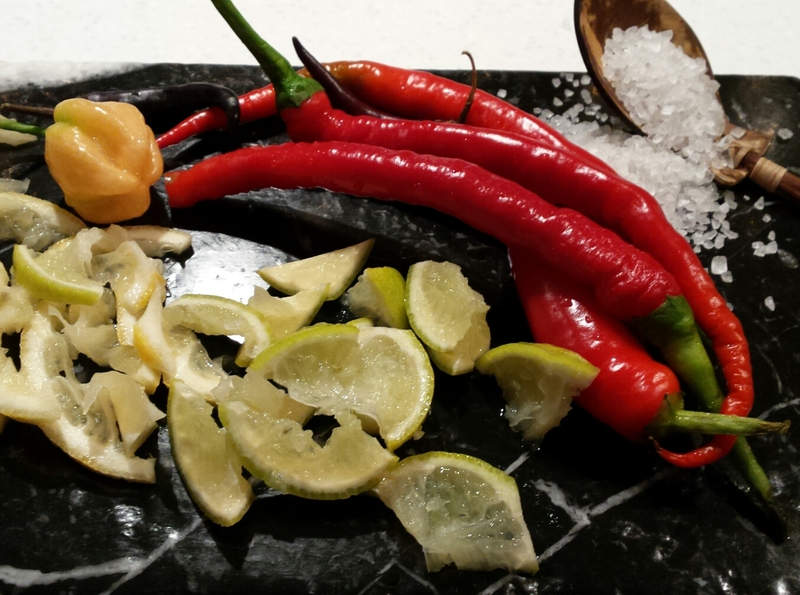 For anyone who likes chilli, pickling is a great a way to preserve them. 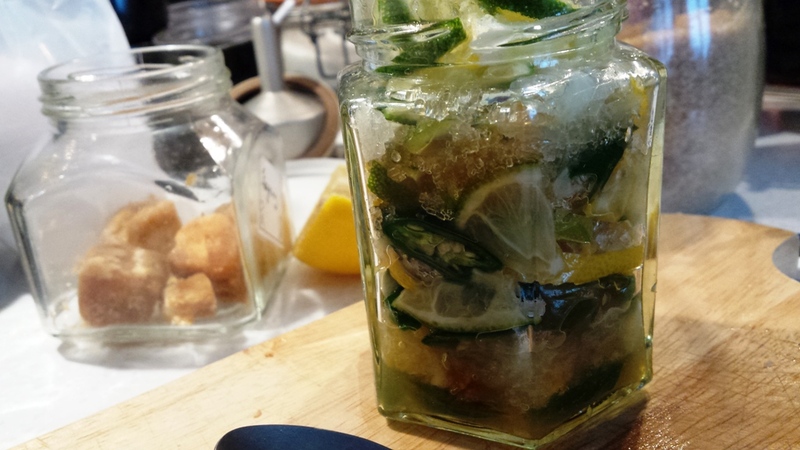 And as we all know pickling is one of the oldest ways of preserving food worldwide. Mauritian like their pickles whether it being fruit pickle, vegetable pickle, chilli pickle everything goes down a treat. 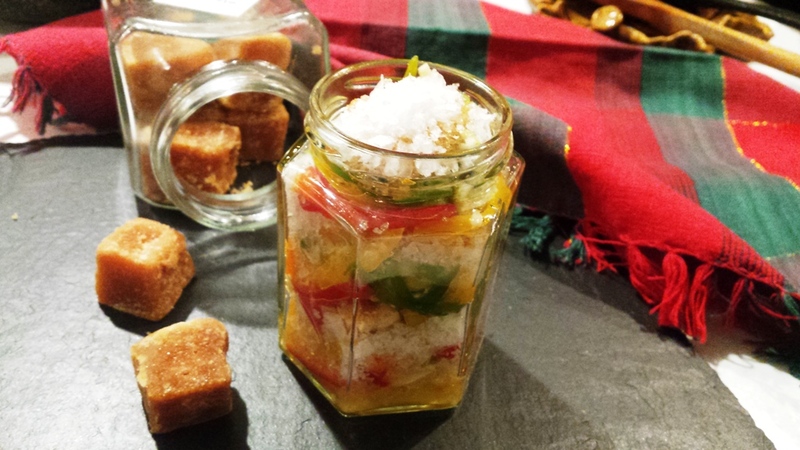 A jar of pickled chilli “piment confit”is very much a must have in every Mauritian household. 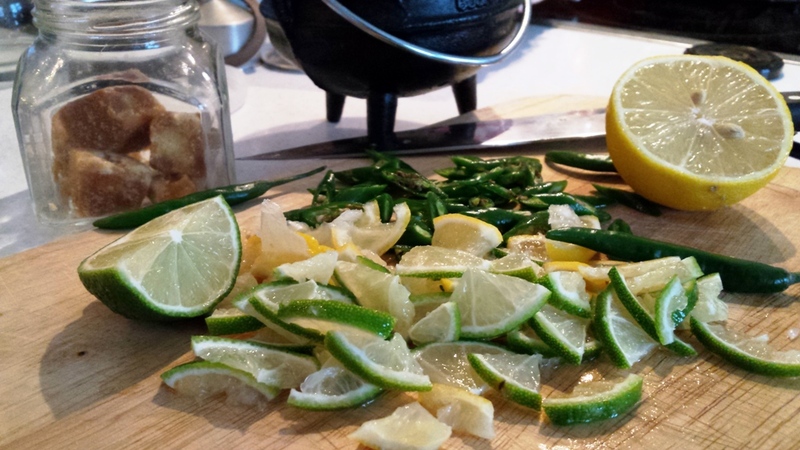 I am a very big fan of pickled lime, lemon and chilli and I seem to do it as soon as one jar is empty. I am sure many of you have come across and heard that chillies have some incredible health benefits. The health benefits of eating chillies is nothing new although much is written about it. However, very little is known about it. The most recent rave about its benefits is losing weight. Spice up your life and lose weight with a little bit of Chilli. Now I am sure this will certainly have many eyes peeled wanting to know more about it – but sorry to disappoint your because I will not talk much about it. But yes several researches have shown that chilli is good in helping people to lose weight. The way it works is simply by increasing the metabolic rate and hence breaking up fats and resulting in weight loss. This recipe of mine is very much my Vitamin C booster during the winter season. I can’t say this too loud but it certainly works for me. It keeps me away from horrible colds in the cold weather !!!!! The reason I like chilli is because of its flavour. As we know chillies are primarily used as spices, accompaniment to some dishes, flavour sauces or even sprinkles in the form of powder. I tend to eat more chillies in the winter than in the summer. I guess it’s because I cannot tolerate too much heat both outside my body and inside. Joke apart but the main reason I use it more in the winter is because of its Vitamin C content. Surprisingly green chillies contains a lot more vitamin C than an orange. It is also a good source of vitamins A and E. So all together chilli helps to boost the immune system and boost metabolism. But like most things too much chillies does have some bad effect if consumed in excess, some of which are burning inside of the mouth, stomach and throughout the whole digestive system. So my advice is to pace yourself, do not indulge and eat sensibly. Handful of chilli – you may choose to use different colours of chilli (but the one most commonly used are the green chillies) – If you can get hold of the little chilli leave them whole. Start by sterilising your jar – place in boiling water, remove and dry completely then set aside. Remove the stem part form the chillies, wash and dry completely with a kitchen towel. If using finger chillies I tend to slice them at an angle but if you can get hold of small chillies leave them whole. 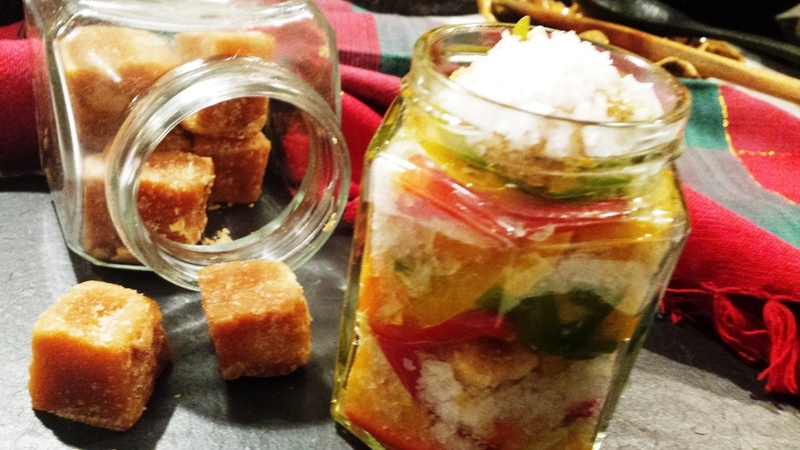 In the clean sterilized jar add one layer the green chilies, lemon and lime slices followed by a layer of crushed Jaggery or demerara sugar and salt. Arrange more layers until you get almost to the top. Cover with the lid and leave to marinate for 1-2 days in a cool place. I tend to leave them on my kitchen counter, they look pretty and colourful and makes a great kitchen edible decor. Serve as an accompaniment to meals or even in salad dressings. Brinda’s Note: Jaggery health benefits- Here, I share just a few; it activates the digestive enzymes and help with good digestion. It is a good source of Iron therefore it plays a key role in reconstruction of red blood cells (haemoglobin) and lowers the risk of anaemia. It is a good cleanser of the liver, therefore a good detox for your body by eliminating toxins from the body. Jaggery is also very good for the immune system and treatment of bad cold and flu. A word of caution like most food it can also have side-effect if consumed in excess. Due to its high sugary content people with diabetes must monitor their consumption.